Picks rounds up from ammo tray. User doesn’t have to even touch ammo. Does not force rounds through the feedlips. It won’t damage the mags in any way. All of the above seems to be 100% true. While the operation can be a bit clunky at first you will quickly get the hang of it. 9mm and 40cal both load up just fine. On a standard 5×10 ammo tray you can either go width-wise (5 rounds) or length-wise (10 rounds) to pick up the rounds. I wouldn’t recommend trying to pickup more than 10 rounds at a time as it can get a little wonky when you place the ‘plunger’ on top and apply pressure. The best thing, in my opinion, about the C.A.M. loader, is that it DOES NOT force the rounds down directly through the feed lips. This of course would have a negative effect if it were the case. Instead there is quite an ingenious action happening when you plunge the rounds downward that clears the feed lips and then backs the rounds into position inside your magazine. The size and weight is negligible. The C.A.M. loader won’t negatively affect your range bag in anyway that I can see. I haven’t had to test the warranty but one thing that does speak to ETS commitment to their customers is their price reduction. When I purchased my unit it was close to $50. Shortly there after the price was dropped to $29.99. That could have been the end of it. Everyone likes lower prices. But ETS sent out a message telling all of their customers who had already purchased to send in their info and receive a $20 credit towards their next purchase. They didn’t have to do that but they did. Gestures like this make me feel like I won’t have to worry about utilizing their warranty if the need should ever arise. Mags that I have successfully loaded. I have only found one issue with the C.A.M. loader. When I first tested the device in my office with brass cased ammo everything worked great. Then, when I first took it to the range I was wanting to burn off some steel cased ammo. I attempted to load it up and it just wasn’t happening. It was so much faster to hand load the steel cases into the magazine that I gave up. As soon as I switched back to brass there was no issue. Worked like a dream. I am guessing because of the aforementioned method in which the C.A.M. 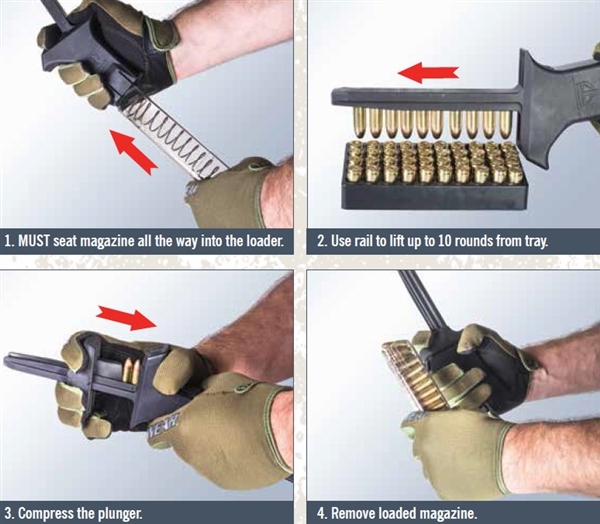 loader slides the rounds in and then backs them up to skip pushing through the feed lips results in too much friction for the steel cased ammo. With the brass cases they simply have no issue. While I would prefer it work with all cases this doesn’t really bother me at all. I did feel it was worth mentioning for those of you who do prefer the rock bottom ammo prices that steel can offer. Not really. It is a great product. I haven’t taken it to any high-round-count classes yet. But as easy as it made things on a few simple range days I would be willing to turn the car around and head back to my house, if I had forgotten my C.A.M. loader, for my next class. ETS has put out a great product and it would make a GREAT gift idea for the shooters in your life. One thing to note. If you insert your mag into the C.A.M. loader and the rounds just aren’t going in when you plunge them down. It is most likely that the mag is not full seated. You really want to give the mag a slap to get it seated (see video above). Also, it seems like some different magazines have little differences on how they like to be seated. Most notable from the mags that I tested for this post was the S&W SD9. It really wanted to be inserted a specific way. Once I figured that out it was smooth sailing.